In my previous article, I describe the importance of not attacking a change agent, but instead taking steps to manage the change, not the change agent. Many managers receive “feedback” that is resistance to change, and then turn around and give that feedback to the change agents, implying that the manager doesn’t actually want the change agent to instigate the change. The first five steps to this were: 1. Listen 2. Document the issue 3. Track the issues. 4. Delay in responding to them 5. Look at the issues as a team. You typically know the source of the resistance/complaint. You tracked it, right? Now you can respond directly to that person. Explain what you did (discussed it as a team) and what you plan to do (keep going with the change, most likely). I am not a fan of communicating broadly the list of concerns and the responses, because it is somewhat akin to public feedback. By communicating broadly, you are trying to adjust the thinking for a specific person via communicating with a broad group. This creates unintended consequence of changing the broad group’s thinking when it isn’t necessarily a problem. It’s better to circle back to the person who expressed the concern in the first place. If there is a network of people who believe the same thing, that person then gets to address the results. Many managers are in the position of instigating and overseeing change on the team, with the intent that this change improves how things are done and obtains better results. But managers can quickly fall into the trap of resisting the change they instigated by reacting negatively to the ramifications of change, and seeking to eliminate all resistances (a.k.a., complaints) to the change. They do this by treating incoming complaints of the change agent as a performance feedback opportunity to the change agent. This implies that the change can occur and without resistance and essentially undermines the change effort. This is a wrong assumption – it’s like assuming that there is no resistance when you start a car and move forward. You probably aren’t the only one receiving complaints. Upon the first complaint, this is your clue that there may be more. Find a place for others on your team to document them. Put them in the same place. Are you asking a change agent to make a change, and then resisting the change? Many managers want to get great results. To do this, they seek and find high performers who drive toward these results. One way a high performer can achieve great results is through creating and implementing structures and processes that provide ongoing value and systemic improvement. Or, in other words, change. The high performer is a change agent. This is what managers want. Managers want change for the better, and rely on the “high performers” to instigate and implement the change. That’s what makes them a high performer. But there is a mistake that many current managers make in seeing this model through: They give feedback to the person instigating the change that there is resistance to the change. This is a flaw in current management design, and one that is all too common. When change occurs in an organization, there inevitably will be complaints about the change. The complaints will be about whoever is instigating the change. It doesn’t matter if it is good or bad change, people somewhere in the organization will be resistant to the change. This is normal and part of the “change curve.” The complaints will be inevitably be about the person instigating the change. That was supposedly the high performer, who was encouraged by the manager to create the change. This is the latest in a series of articles about how using perceptions in managing a team can be a recipe for disaster. Think about the manager who says, “There’s a perception that you expect too much of other people” or “There’s a perception that you are not very well liked.” This is the manager attempting to manage perceptions and not behaviors, and is something that needs to be banned from the manager’s vocabulary. I provide reasons here, here, here, here and here (there’s a perception that this is a very thorough series!). If a manager can cite only negative perceptions of someone as the negative impact, then this could be an indicator that the person could actually a positive change agent in the workplace. Many people are resistant to change, and when someone brings it to the organization, that resistance will manifest as undifferentiated negative perceptions that quickly propagate through the organization. The actual change may be good and improve things, but with any change the initial perception is that the change is bad in some way. In today’s article, I take an instance of when a manager feels compelled to use the line “There’s a perception that. . .” as a means to give performance feedback. For example, a manager may intend to “help” the employee by saying, “There’s a perception that you are difficult to work with.” The implied notion is that the perception is the negative impact, and “being difficult to work with” is the behavior that needs to change. However, this is badly given performance feedback, and there is an alternative! Citing perceptions as feedback is the reverse order of good performance feedback, so let’s turn it around. By leading with the perception, manager reverses the order of feedback and eliminates the other steps. It starts and ends with the so-called impact: The negative perception of being difficult to work with. Aside from the generalization of the employee being difficult to work with, there are no cited behaviors that lead up to the perception. The impact, however ephemeral, is the feedback. Using perceptions to manage: What does this tell us about the manager’s feedback providing skills? When a manager adds the perception line, it creates all sorts of chaos. Check here, here, here, here and here, for some reasons behind this chaos. But it also give us insight on how performance feedback can be improved by understanding why a manager wants to use the “perception” line in giving feedback. Here is what we can learn about the actual feedback being provided when the manager breaks out perceptions as the key ingredient to the feedback. Using the line, “There’s a perception that” is automatically a modifying clause that takes you one step away from the specificity and immediacy of whatever behavior is being discussed and asked to be modified. The feedback is by definition not immediate since a time lag is generated: There was a behavior, then there was a perception. The feedback is by definition not specific, because the discussion is about the perception and not the behavior. The discussion centers around the non-specific perception and distracts away from the specific behavior. In order for feedback to be effective, it needs to be specific and immediate. Using perceptions to manage: What does this reveal about the manager? In previous articles, I’ve listed 12 reasons this behavior should be removed (here, here, here, and here). If you find this entertaining reading that may resonate for both employees and managers alike. So let’s continue this list, this time focusing on what managing using perceptions reveals about the manager. By using the “there’s a perception that” line, it essentially trains the employees to think and use back at you the same damaging rhetoric being used on them. In fact, upon training the employee to think perceptions first, this is probably the thing in the employee that will most likely change. The employees will start creating “perceptions” about the manager, and most likely they won’t be directly to the manager. Instead, they will extend the negative and difficult perceptions around the workplace about the manager. “There’s a perception that our manager isn’t comfortable giving feedback, no matter what we do or what results we get. Using the “There’s a perception that. . .” line reveals that you are a manager who wants to receive feedback via the veil of perceptions. When a manager uses the “there’s a perception that” line, it indicates that the manager himself is not sure as to what is true and what is not true. The manager is ultimately non-committal to the actual events, yet still feels comfortable giving “feedback.” This reveals the manager as a “gutless wonder” (thanks, “Strictly Ballroom!” for this term) who wants something to change, but is not committed to that change. As such, this reduces trust with the employee. Without the manager commitment to changing the behavior, this means that the manager will likely undermine either the changed behavior, or the unchanged behavior, creating an overall untrustworthy work relationship. Using perceptions to manage: Are positive perceptions cited? I believe that these words, “There’s a perception that” need to be removed from a manager’s vocabulary. I provide three reasons here, Three more reasons here, and three more reasons here. But I have more reasons! Today I examine why positive perceptions are not cited when managers manage perceptions. 11. It twists positive feedback into negative feedback even for positive behaviors and perceptions! Let’s take a look at the below chart. In it we have an example of a manager giving negative “feedback” and positive “feedback” while inserting the “there’s a perception” line. Normally, when you give positive feedback on something, it means that you want the employee to keep doing that behavior, or do it with more frequency. 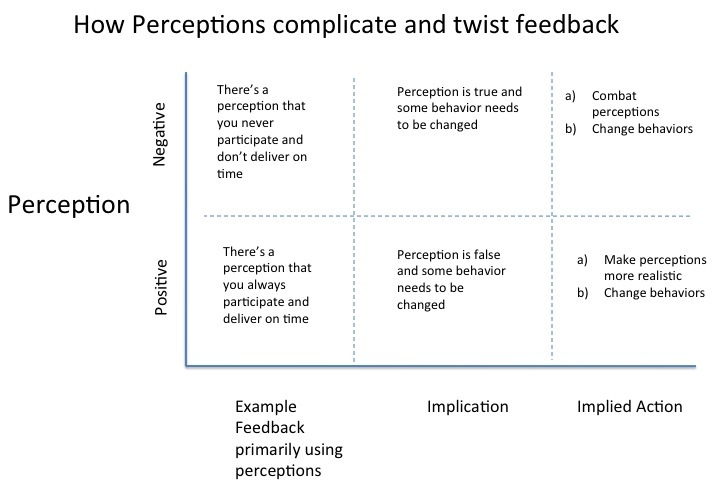 But in this chart, you can see that by adding the “there’s a perception” line to the positive feedback, the implication is that something is wrong – that the perception is false in some way and the perception needs to be adjusted to a more realistic perception. (Ironically, when the perception is a negative one, that perception is widely believed to be true.) On top of that, the implication is that the underlying behaviors that created that over-inflated perception also need to be changed so that future perceptions will be the more realistic perception. So by adding the “there’s a perception” line to a positive behavior, it turns it into a negative perception and a negative behavior. Now the employee has to change both perceptions and the underlying behaviors – on something that is being praised! Today I continue my series on managers managing perceptions, and how attempting this creates difficult situations and doesn’t resolve problems. When I say, “Managing perceptions”, I’m thinking of when a manager attempts to use perceptions as the basis for what is being managed, rather than using observed behaviors to manage the team. Imagine a manager who attempts to give feedback by saying, “There’s a perception that you are easily excitable” or “There’s a perception that you easily get confused.” That’s using perceptions to manage. In previous articles, I discuss how this deflects from actual performance and creates confusion as to what is real and not real. In today’s article, I discuss some more unintended consequences of a manager relying on perceptions to manage the team – how it creates an instant culture of gossip. This article is a continuation of a series on a common manager mistake: Using perceptions to give feedback to employees. Think about a manager who says, “There’s a perception that. . . you are having a tough time at work” or “There’s a perception that things don’t come easily to you” (and all of the other perceptions that may or may not be out there). In my previous article, I described how this doesn’t meet the standard of performance feedback, it shifts performance to a phantom job of managing perceptions, and it transitions the manager away from the role of setting the tone for the team. In option a, it doesn’t matter if the employee is always late or not. That’s not what’s being debated. In option b, the employee can (and should) debate the actual frequency of being late (since it is highly unlikely that the employee is always late). However, the perception can be true. So if the manager uses the “perceptions” qualifier, it shuts down the ability to pursue what is true.